Display, store and protect treasured keepsakes and collectibles. 7 green, felt-lined drawers and a glass top keep everything safe, scratch-free and fully organized. 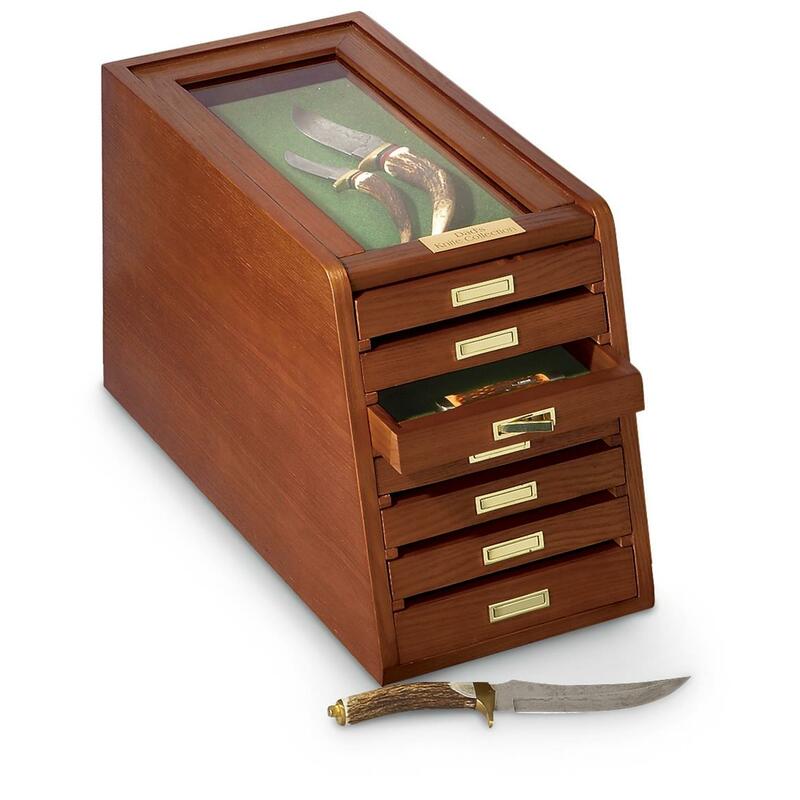 A must-have unit to show off and store your prized collectibles such as knives, calls, antiques, photos, lures, watches, jewelry, coins, spoons, military medals, shot glasses and more. For your den, trophy room, library or family room. 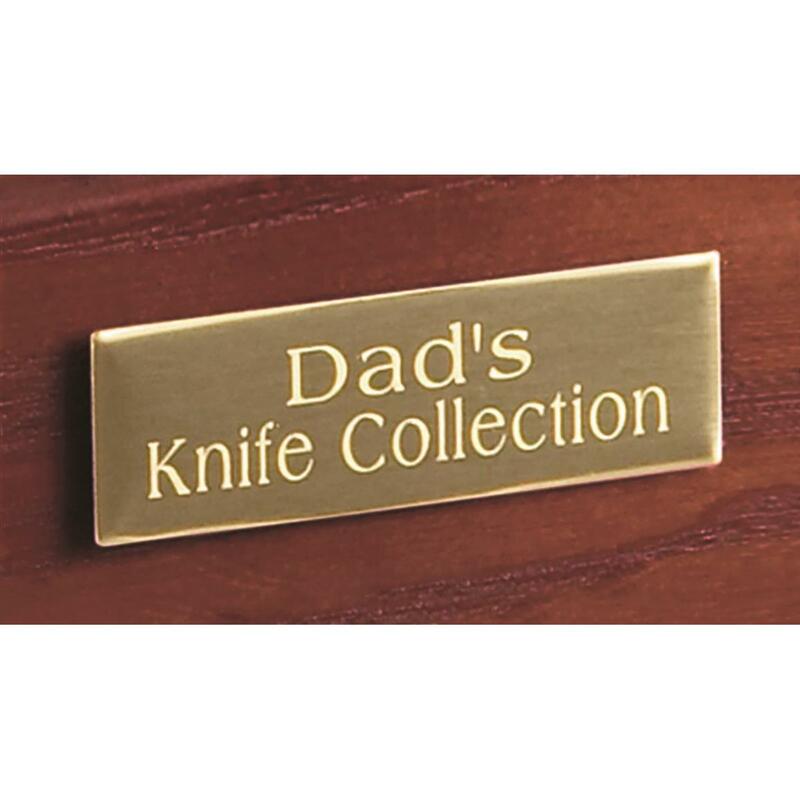 Engraving available on a brass plate (2 lines, up to 24 characters per line) for just $8 more. Get one for yourself or as a gift for the collector! Size: 9.25" x 20" x 12.4"h.
CASTLECREEK Collectors Cabinet Display Case is rated 4.4 out of 5 by 80. Rated 5 out of 5 by Barb from Looks great, good value! Finally my husband has a beautiful place to store his knife collection! Doesn't take up much room looks great! Rated 2 out of 5 by Linda from Good price but cheaply made I bought this for my grandson for Christmas. He has a huge knife collection. I was so embarrassed when I saw how cheap it was made. The wood on the top was broken, one of the drawer pulls was missing, and the bottom front corner had been smashed. The stirofoam it was packed was thin and all the pieces were broken. It should have been more securely packed for protection. My grandson loved how it was made so I will probably try to swap it for one that can be better packaged and hopefully it will be in better shape. Rated 3 out of 5 by Long Time SG Customer from Same Issues as Other Reviews Front molding that holds the glass had come loose, so I had to re-glue it. Multiple areas where the stain had worn off, probably because it wasn't dry when packaged. Otherwise, it arrived intact and on time. Custom plaque was correct, although it was too big to fit anywhere other than onto the glass. Overall, worth the low price. Rated 3 out of 5 by Curious yeti thoughts from Decent A few issues with it. Overall the woodwork craftsmanship isn’t very impressive. There are several spots missing stain on the wood and the drawer opening tabs don’t always open properly. The top glass piece isn’t secured very well and slides around. Product arrived missing the personalized engraving plate but Sportsman’s’s Guide staff had it shipped out the next day. Had this not been a Christmas gift I would’ve returned for another but the timing wouldn’t allow me that opportunity so I just stuck with it. I give it 3* even though it has flaws but my dad liked it and it does have several drawers for storage. Rated 2 out of 5 by JSuda from Not happy but it serves my purpose. Chinese junk. Had to glue a piece of molding when I received it.However, It would have taken me a month or two to build one myself.Over my 63 years I've accumulated quite a treasure trove of neat thingsthat fit nicely into the cabinet. It serves me better than my sock drawer! Rated 5 out of 5 by Carrie from Beautiful case; the best customer service!! Beautifully made and a perfect case for my son's knife collection! !